Steven (Chicagoland, United States) on 21 November 2017 in Documentary & Street and Portfolio. An impressive memorial to be seen as you enter the downtown of Niagara-on-the-Lake. 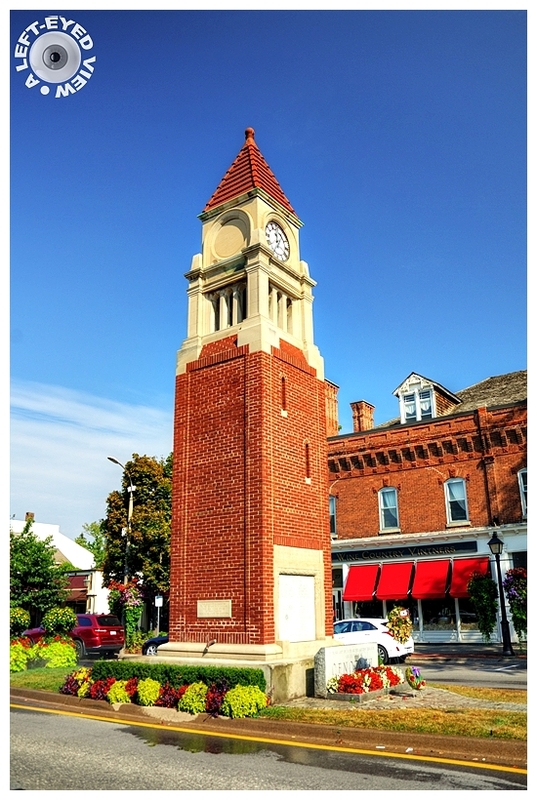 This wonderful clock tower is the centerpiece of the beautiful downtown area of Niagara-on-the-Lake. This fitting tribute to the men of this region is a pleasant reminder of how remembrance and community spirit can work together to create something special. FOR OUR FREEDOM. TO THE MEMORY AND HONOUR OF THE MEN OF NIAGARA ON THE LAKE WHO GAVE THEIR LIVES IN THE GREAT WAR 1914-1918 AND IN WORLD WAR II 1939-1945. THIS CENOTAPH IS DEDICATED TO THE MEMORY OF CANADIANS WHO DIED IN THE SERVICE OF THEIR COUNTRY THEIR NAME LIVETH FOREVERMORE. Photo captured September 26, 2017. Très jolie tour avec les briques rouges. Quelle tour ocre et vue quelle image et captage sueprbe. Espléndida vista de arquitectura, con lindos colores y luz. ***** Saludos. Beauty and perfection, so well done ! All looks so clean and well-maintained ! Probably the most colourful cenotaph I have even seen!? A real gem, and this sunlight makes the brickwork stand out beautifully against that pretty sky. Great pic. A beautiful memorial. ANother picture postcard image. An excellent picture of this impressive clock tower. The history and memorial makes it very interesting. An impressive clock tower. I like a lot ! Beautiful light and I did not know the term cenotaph. Now I've learned a new word. pour que n'on oublie jamais..
A very lovely memorial. The colors captured here are superb. A beautiful clock tower and such a lovely tribute. I like the nice landscaping around the bottom. Nice. I like those warm coloured bricks that seem to dominate there. It is a very fitting memorial - thank you for including the history and the words. Your image would have stood alone - but the narrative makes it even more meaningful! Beautiful memorial under this light.